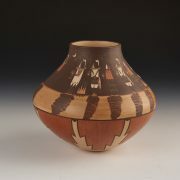 Mark called this jar “A Gathering of Warriors.” Made in 2007, Mark prided himself on expanding his art horizon, and this time his ideas were sparked by the kiva art found in the prehistoric site of “Pottery Mound.” This Anasazi site was excavated, and the murals recorded in the late 1950s and early 1960s. 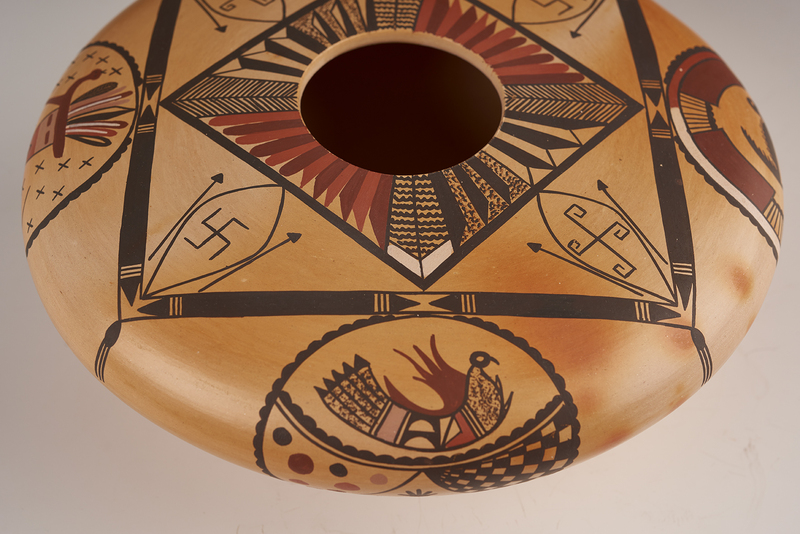 Mark selected shield designs from the murals as the theme of this beautiful jar. Above, left, the shield shows a warrior holding a spear. 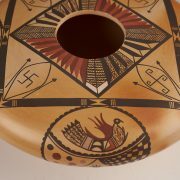 Above, right, is a bird with other designs below it. 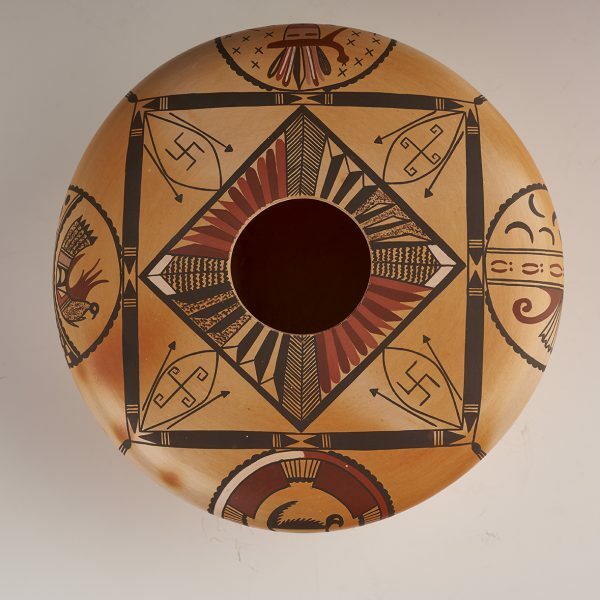 Mark said that he used his own imagination, thinking what might have been an Anasazi shield design. To the left, the shield shows a bear surrounded by feathers. Right, the shield contains a series of rock art drawings and a feathered head piece. 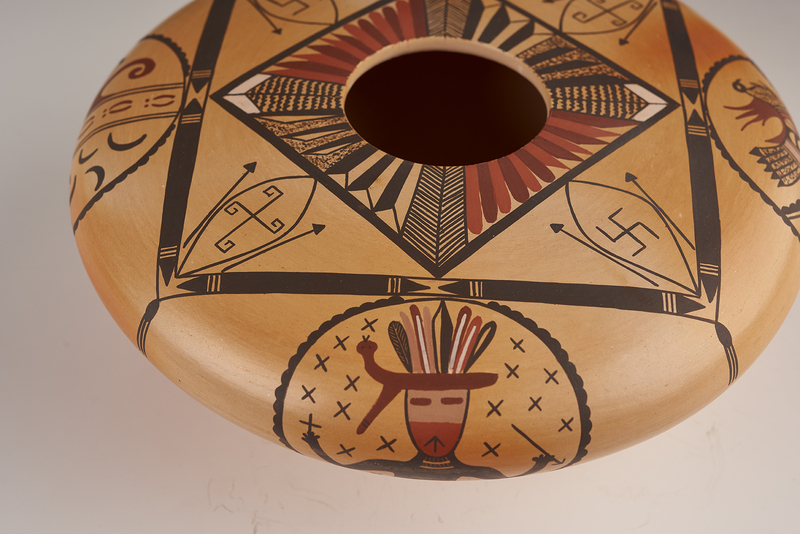 In the four corners, Mark pictured four shields, with spears drawn beside them. The center in a series of bird feathers. When discussing the designs on the shields. Mark says that these signs are rock art symbols. 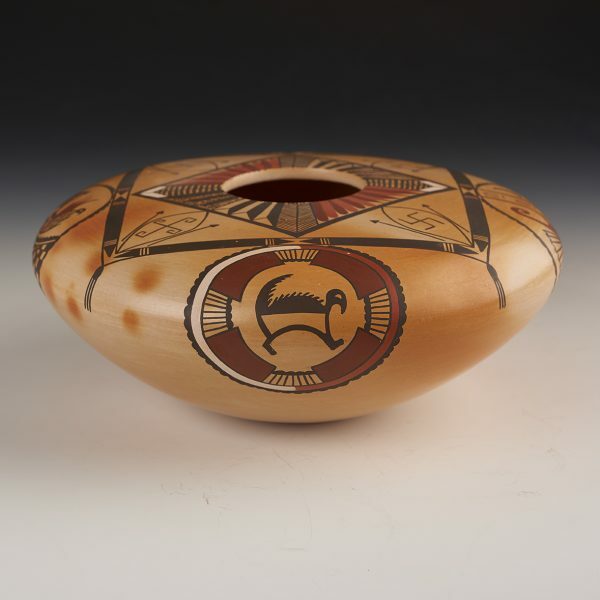 The Navajos call them “Whirling Logs.” The Hopis call them “Whirling Winds.” It is a beautiful example of his work. The process of making pottery is a time-honored tradition among the Hopi-Tewa potters of First Mesa, Arizona. The clay is dug from the earth and the impurities are filtered out. 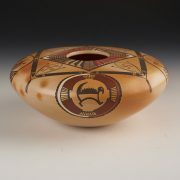 Then the bowl is formed in the traditional method of layering coil upon coil. 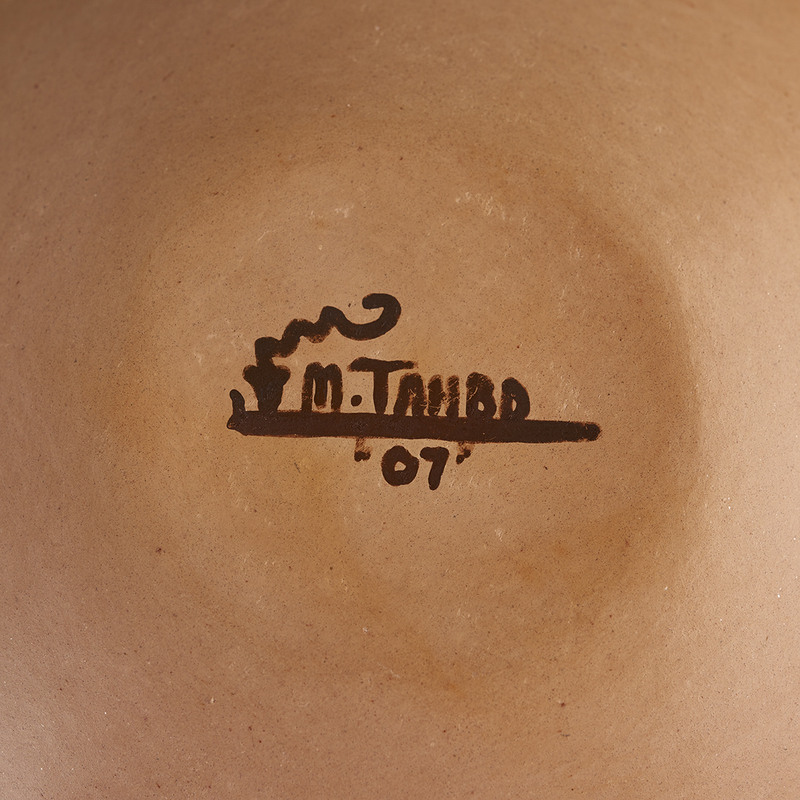 Mark Tahbo does not use any additional clay slip to polish his bowls, but re-wets the body of the piece and then uses a stone to burnish it. This is the process that creates the high shine on his work. Their bowls are fired in a traditional outdoor firing, using sheep manure and old pottery shards as part of the process. Markfs work is deeply influenced by his Hopi-Tewa ancestry. However, he is an individualist artist at heart. Mark has so much creativity and innovative spirit reflected in his art work. 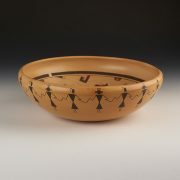 He is the great-grandson of noted potter Grace Chapella. 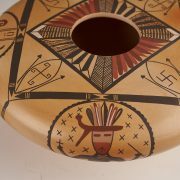 Today, they Mark is among the leaders of the Hopi-Tewa potters.